Old Bothwell are a company that came out of nowhere a couple of years ago with a bunch of well-priced casks of Port Ellen, almost all of which were reviewed very well. They seemingly sold everything they had and no more has been heard from them since. I have a suspicion that their stock was purchased by other companies who have since been charging far more for it but I base that on nothing but my gut; to be fair to my gut though the only other thing it ever tells me is that I’m hungry and it’s always right about that. This bottle was the first Port Ellen I ever purchased and I remember agonizing over it as paying more than $200 for a bottle of whisky was not something I’d ever done or thought I’d do. Now, of course, the price I paid for this, even if it were far poorer than it is, would be a steal. Diageo’s latest special release of Port Ellen is going for £2000 or so–a 50 ml sample of that would cost as much as I paid for this entire bottle. This cask is referred to on Whiskyfun as having been bottled for Thosop bvba, the indie outfit of ex-Malt Maniac, Luc Timmermans. It must have been split because I did not get my bottle from them and the label has no mention of Thosop on it. Nose: Not very much peat or smoke at all. Mostly lemon, almond oil, smoked oysters, some pepper and brine. Gets more minerally with time and the lemon gets stronger too. With more time and air there’s more peat and a growing coastal quality: brine, kelp, shells. With a lot more time there’s some hints of darker citrus as well (orange peel?) but mostly it’s lemon zest, pepper and salt crystals and just a bit of soot. Everything gets rounder with water and there’s some tart apple now to go with the lemon; some olives too. Palate: Minerally peat at first followed by lemon and peppery olive oil. And then an unexpected hit of smoke that just spreads and spreads under the lemon and pepper. After a few sips, however, the smoke seems more restrained and now there’s wet stones along with the lemon. Water brightens the lemon up and also brings out more coaly smoke. Finish: Long. Lemon, pepper and smoke. It is on the finish that the smoke is the strongest, and the lemon gets sharper too. Not much change with water. Comments: The nose suggests it’s going to be mild and restrained but the palate packs a little kick and the finish is rather smoky (though not particularly medicinal). That increasing intensity from the nose to the finish is very nice. Not the widest band of aromas and flavours but if you like this profile this is pretty textbook. The good news is it is certainly nothing that can’t be found in malts from extant Islay distilleries (this is reminiscent of both Caol Ila and Lagavulin). 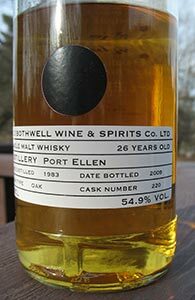 This entry was posted in -Whisky by Rating, 90-94 points, Old Bothwell, Port Ellen, Whisky by Bottler. Bookmark the permalink. Drinking this again tonight and had a moment of panic on the first sip as it seemed very flat. The bottle’s been open for a while—I can’t bring myself to finish it—or the other couple of Port Ellens I have—because, after all, how the hell am I ever going to be able to afford a good Port Ellen again? (Even the marginal ones listed at Whiskybase and The Whisky Exchange are now north of $600.) Happy to report though that after a good ten minutes of airing it’s as reported above. I think the inert gas spray I use (Private Preserve) might be having this damping effect. Has anyone else noticed it? Almost three years later, I’m finally almost at the end of this bottle and I am very pleased to report that it is still holding up excellently thanks to Private Preserve—the bottle has now been open for almost 6.5 years. I wouldn’t change a thing in my notes. Finally killed this bottle tonight—though I still have a 2 oz sample put aside from when the bottle was first opened. Just an excellent whisky. I’m down now to one (open) bottle of Port Ellen. It will be my last.